Many people agree that Yogyakarta is the cultural center in Java, since it is rich with its cultural heritage. 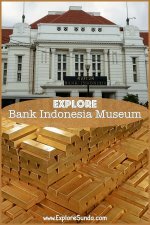 There are so many things to see and do in this historic city, so we compile the top 5 activities you should prioritize when you visit Jogjakarta. 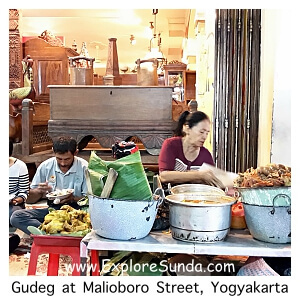 The name of Yogyakarta is shortened from Ngayogyakarta Hadiningrat, the name of famous kingdom in this area. Informally, it is also called Jogjakarta, shortened as Jogja. Thus, the first on the must do list is to visit the palace! Keraton Yogyakarta is conveniently located in the center of the city. It is open for public. There will be tour guide who will explain all the areas we pass and the history behind them. Candi Borobudur (Borobudur temple) was built in the 8th century. It is the largest Budhist temple in the world and it is one of the 7 Wonders of The World. Borobudur temple is made of stones, where most of its walls are covered with relief sculpture of the story of Budha. The temple is decorated with hundreds of Budha statues. Candi Prambanan (Prambanan temple) is a complex of Hindu temples. There are 3 big temples for 3 divine Hindu gods: Shiva, Vishnu, and Brahma. The walls are decorated with relief sculpture of Ramayana epic. They are surrounded by other smaller temples. Prambanan temple is one of the largest Hindu temples in the world. It is included in the list of UNESCO World Heritage Site since 1991. Although batik is widely used and produce all over Indonesia, batik jogja is very famous. We can see collection of hundreds antique batik in this museum. The tour guide will explain the process of producing batik and the different patterns and colors of batik from different regions. We also can try to do batik, guided by their experienced staffs. 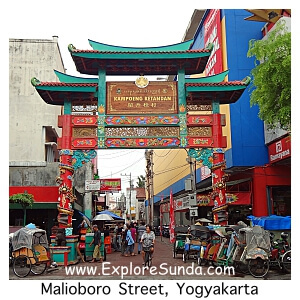 Malioboro street in Jogjakarta is very famous. The street is in the center of the city and at the end of it is the keraton. Most of the shops in this street sell souvenirs from Jogjakarta, such as handy craft, batik, bags, snacks and Jogja t-shirts. There are shopping malls too. There are many batik shops/boutiques where we can buy good quality of batik shirt or dress. They also sell batik tulis here. The more interesting part in Malioboro street is shopping at the sidewalk. There are hundreds sellers along Malioboro street. Often we will find something unique there and sometimes we can bargain the price. Don’t forget to try the special snack from Jogjakarta: bakpia pathuk. 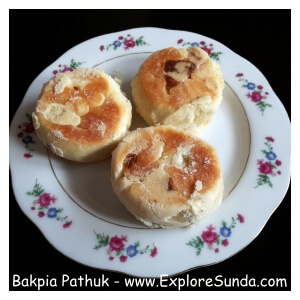 Bakpia has many layers like pastry and filled in with mung beans, chocolate, cheese, etc. During the night, the sidewalk is used for lesehan, where many food vendors sell their food and we dine in on the mat on the sidewalk. The special dish from Jogja is gudeg. It is combination of rice with cooked jack-fruit, cassava leaves or spinach, tofu, eggs, fried chicken or steamed chicken. My favorite vendor is the old lady in front of Mirota furniture (the second shop, smaller than the first Mirota in front of Beringharjo market). She’s been my favorite since I was young, so she’s in the business for more than 30 years! Every night she starts at 7pm until all food are sold, during low season she’s there until 2am. 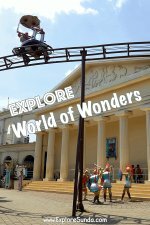 Do you still have some free time in Jogjakarta? You can go to Taman Pintar near keraton. Alternatively you can see Jackass Penguin and feed lori birds in Gembira Loka Zoo. 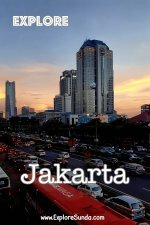 Since Jogjakarta is one of the top tourist destinations in Indonesia, there are plenty of accommodations all over the city, range from the five stars to the inn and guest houses. We always prefer hotels near Malioboro streets, it’s simply to be closed to our favorite dinner, the gudeg :), and we can go shopping at Malioboro streets anytime we like without fussing about the car park (Malioboro streets is free of carpark and it is difficult to find one nearby) or transportation to go there.